The following story was part of an address given by Kourken M. Sarkissian during the conference titled, “Problems of Genocide,” co-sponsored by the National Commission on the 80th Anniversary Commemoration of the Armenian Genocide, Republic of Armenia, and the Zoryan Institute, held in Yerevan, April 21-23, 1995. Your Excellency, President Levon Ter-Petrossian, Your Holiness Karekin Sarkissian, Catholicos of All Armenians, Eminent Scholars and Fellow Armenians. It is a great honor for me to address you from this podium. A great honor for me as a person, as a representative of the Zoryan Institute, and as a member of the Armenian nation in diaspora. Speaking as an individual, let me say that I am the son of genocide survivors. My father is now 90, my mother 82. His father was hanged, his mother raped and killed, and of the nine children in the family, only he and his five-year-old brother survived. The story of my mother’s family was different, atypical, but not to be neglected for that reason. My maternal grandfather was hanged in front of his family, which included his pregnant wife, my grandmother, and four children between the ages of two and eight. A Turkish businessman, Haji Khalil, had been my grandfather’s partner, and had promised to care for his family in case of misfortune. When a disaster greater than anything either of them could have imagined struck, he kept his promise by hiding our family in the upper storey of his house for a year. The logistics involved were extremely burdensome: including my grandmother’s niece, there were seven people in hiding. Food for seven extra mouths had to be purchased, prepared and carried up undetected once a night and had to suffice until the next night. Khalil’s consideration was such that he even arranged for his two wives and the servants to be absent from the house once a week so that my grandmother and her family could bathe. When two of the children died, he buried them in secret. He took tremendous risks and his situation was precarious, because his servants knew what he was doing. Had he been caught sheltering Armenians, he would almost certainly have shared their fate. Luckily, his household was loyal and discreet, and so I was one of the few children of my generation and neighborhood to grow up with uncles and aunts, all of whom remember the Turk Haji Khalil -may God bless his soul. I grew up in the predominantly Armenian districts of Aleppo and Beirut, attended Armenian schools and joined Armenian organizations like the Zavarian movement. The dream of a free, independent Armenia and of the nightmarish genocide perpetrated by the Turks became the obsessions of my life. Both from Armenian organizations and from other survivors I learned that Turks had been inhuman monsters, and indeed many had behaved as such. Yet the memory of Haji Khalil was also part of my consciousness, and so I grew up with a dichotomy, knowing the story of a humane Turkish man, his family and household. This internalized duality taught me that truth and justice cannot be had easily; they must be searched for. The conflict and questions I felt remained with me as I migrated to the USA, studied engineering and became a businessman. The desire to pursue the truth and to share it with others led me to join hands with a childhood friend and to establish the Zoryan Institute for Contemporary Armenian Research and Documentation. Its objective was, and remains, the study of modern Armenian life. This has come to mean that our work is devoted to three topics. First, the Genocide, which was the plan to annihilate an ancient people. Second, the Diaspora, a tragic consequence of the first. And third, the homeland itself, where the dream of a free and independent Armenia has begun to become a reality. Honored guests and fellow Armenians, speaking as a member of the diaspora, I want to say that all of us want the Armenian nation to build a state with flourishing political, spiritual, military, economic and intellectual institutions. 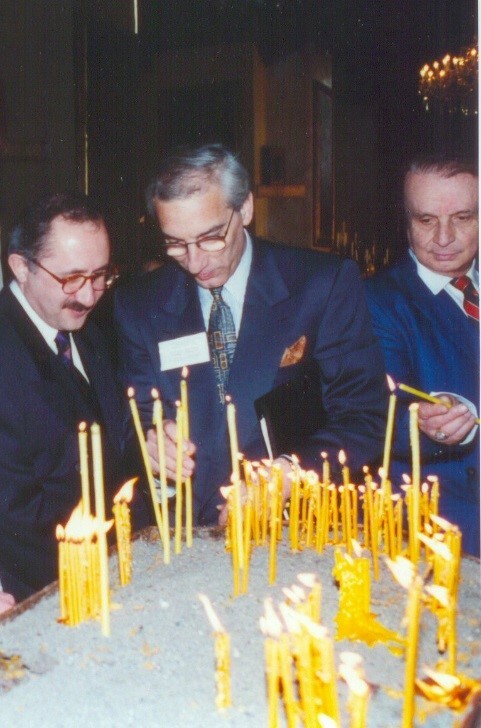 We consider the diaspora to be part of the nation if not of the state, and feel that it must contribute to the building of the Republic’s strength through such organizations as the united Church, the Armenian Business Forum, the All Armenia Fund and many other organizations dedicated to Armenia. We believe that the Armenian state is now the focus of the hopes of a large diaspora and that it is also bound to be, along with the Church, a central element in the formation of an Armenian identity for new generations of diasporans. The state has the right to demand the support of all Armenian people everywhere; and in return it is expected that the state remain sensitive to the feelings and thoughts of four million diasporans on issues such as, for example, justice to the victims of the Genocide, as stipulated in Article 11 of the Declaration of Independence. And also, I might add, to those endangered even as we speak, be they Rwandans, or Kurds, or Bosnians. With this conference, the government of Armenia and the Armenian diaspora, as represented by the Zoryan Institute and the many scholars here today, have taken a step to fulfil their share of responsibility. I call upon all other scholars, officials, reporters and especially on the Turkish people to begin to do their share, because our collective, global future can only be founded on truth and justice.